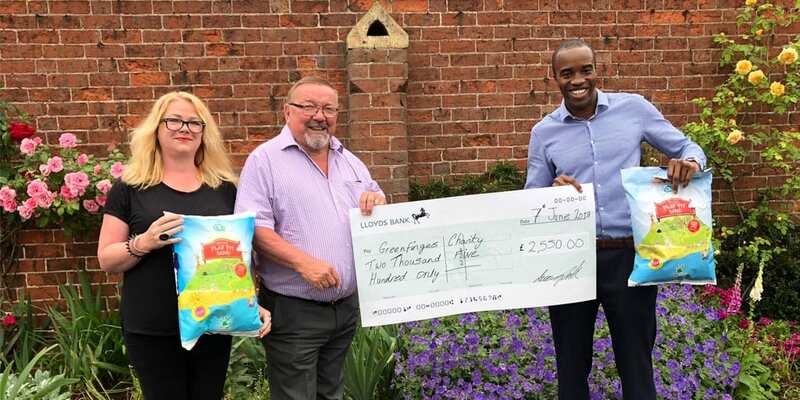 A cheque for £2,550 was presented to children’s hospice garden charity Greenfingers, as a donation from decorative aggregate specialist Deco-Pak at the GIMA Charity Golf and Activity Day (Thursday, 7th June). The money was part-raised over the last 18 months through a play pit sand promotion that is to continue throughout 2018, with the goal of raising over £10,000 by 2020. Deco-Pak’s Greenfingers Play Pit Sand, large pack retailing at £3.99, is ideal for young children taking their first steps in creative outdoor play. A smaller 10kg pack is also available with a retail-friendly easy carry handle, at £2.99 RRP. Visit www.deco-pak.co.uk, connect via Twitter @deco_pak, or call the sales office on 01422 204394. Previous post: Deco-Pak’s new Decorative Garden Products and how they coped with the bad weather?